An oregano-seasoned burger with artichoke and spinach dip, crumbled Feta cheese, crisp bacon, Romaine lettuce, tomatoes, and garlic mayo, served on a crisp ciabatta bun! Romaine lettuce, tossed with lemon dill ranch. Topped with an oregano-grilled chicken breast, black olives, diced tomatoes, cucumbers, and Feta cheese! Have you ever had the pleasure of dining at a Red Robin with your family? We visit the Red Robin in our area frequently with B and the Princess; it's our absolute favorite place to hang out and get a great meal with the kids. The atmosphere is so much fun, and most importantly it's family friendly! We had the opportunity to try out the new Mt. 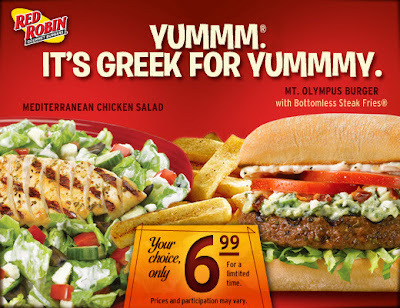 Olympus Burger and Mediterranean Chicken Salad ( both specials available for a limited time only) at our favorite area Red Robin location recently; what a great experience we all had! The Mt. Olympus Burger is absolutely delicious, served with Red Robin's "Never Ending" Steak Fries...my husband clearly enjoyed it; leaving not a morsel behind....YUM! The Chicken Salad was also equally delicious, I LOVED the dressing! If they bottled it, I would buy definitely buy it! The kids really enjoyed coloring and looking around at all of the colorful and eclectic decor. We all left with a smile and the kiddo's with a balloon in hand, asked when we could come back again before we had even made it out the door! I would absolutely recommend checking out these two great specials! Available at participating Red Robin locations for a limited time only (Available through November 7, 2010)! Great Food & Fun! One Lucky Reader will receive a $25 Gift Card to Red Robin! Leave a comment~ Visit http://www.redrobin.com/ and let me know which dish you'd love to try the next time you visit Red Robin. The comment is considered your entry. Entry to this giveaway ends at 12pm PST November 21, 2010. Winner's are chosen randomly through random.org. The winner will be announced in a post within 7 days of the giveaway ending, and contacted through email. The winner will have 48 hrs. to respond or another winner will be chosen. I'd pick the Whiskey RiverBBQ Chicken Wrap and an order of the Towering onions...to share...MAYBE! LOL! I have tried the tower before and the sauce is FABULOUS! I follow Red Robin on TWitter! I would like to try the Chicken Caprese Sandwich...thanks! Definitely the Royal Red Robin Burger! I'd like to try the teriyaki chicken sandwich. I follow via GFC. I'd love the Blue Ribbon Burger. Tweeted, followed, hoping to win! TOWERING ONION RINGS ARE THE BEST AT RED ROBIN! I follow @savvycouponmom as @bluenilequeen and also follow Red Robin and like them on facebook. I tweeted #WIN $25 Gift Card to Red Robin Restaurants! @savvycouponmom http://bit.ly/as3woL #GIVEAWAY from my @bluenilequeen page and I also entered the contest to win the Ipod Nano with multitouch. I'd love to try the Chicken Caprese Sandwich! The tomato & mozerella look so good on it! I "Like" Red Robin on FACEBOOK as Silver Bella! I would love to get my hands around the Whiskey River® BBQ Burger! Looks awesome! I enter the LEE PREMIUM SELECT JEANS giveaway. I enter the DREMEL TRIO BY BOSCH giveaway.